Cut down each side of the backbone of the chicken using poultry shears or kitchen scissors and remove. Flip chicken over and press down on breast bone to crack it. Trim the tips of the wings. Salt the chicken liberally and place on a wire rack inserted into rimmed baking sheet. Refrigerate for 3 hours or overnight. Combine softened butter with mustard, maple syrup, Worcestershire, sage and black pepper. Toss apples with lemon zest and juice, nutmeg, sugar, salt and pepper. Set the chicken on a rack aside and wipe off the baking sheet. Onto the baking sheet, place potatoes and onions, and toss them with olive oil, salt, pepper and thyme. Add apples and toss to combine. Pat chicken dry with a paper towel and place about a tablespoon of the mustard butter under the skin of each breast. Slather the remainder of the butter evenly over the bird. Set the coated chicken directly on top of the apples, potatoes and onions and roast 45 minutes to 1 hour, or until it reaches an internal temperature of 165°F. 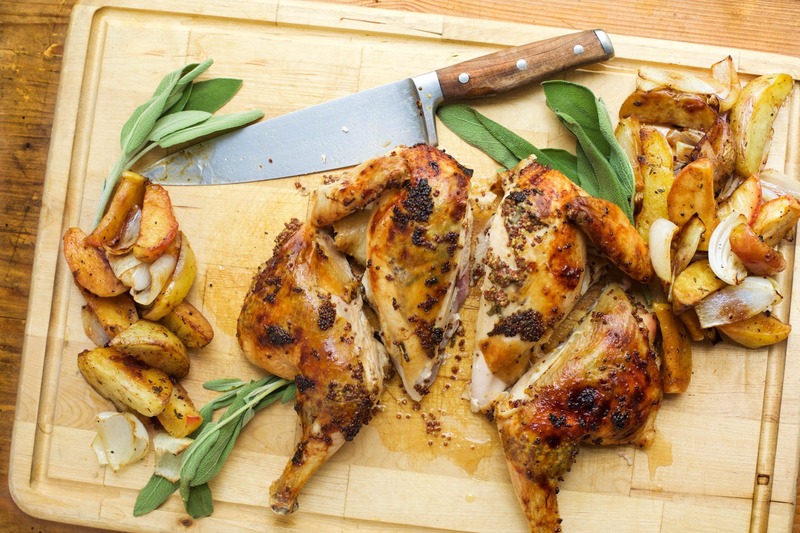 Cut chicken into quarters on a carving board and toss the apples, potatoes and onions in a serving dish. Coat the potatoes and apples with drippings and serve alongside the chicken. In Recipes-list.com we have selected the most viewed recipes from category - uncategorized . Enjoy the best recipes specially selected for you! Chicken with Maple and Mustard, Apples, Potatoes and Onions is the right choice that will satisfy all your claims.